'S e prìomh-bhaile na stàit Ghearmailteach Rheinland-Pfalz a tha ann am Mainz (Frangais: Mayence). Tha Mainz suidhichte air bruach ceàrr an abhainn Rhein. Sa 2008, bha 197,623 daoine a' fuireach ann. Tha Mainz faisg air Darmstadt agus Frankfurt. Chaidh am baile a stèidheachadh san 13 RC leis na Ròmanaich mar Moguntiacum. Chaidh an cathair-eaglais (Mainzer Dom) a thogail le Àrd-easbaig Willigis bho 975 (neo 976) gu 1009. 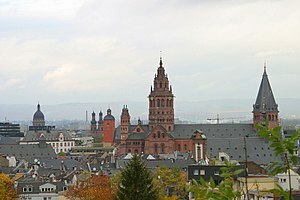 Air a tharraing à "https://gd.wikipedia.org/w/index.php?title=Mainz&oldid=497312"
Chaidh an duilleag seo a dheasachadh 24 dhen Ghiblean 2015 aig 13:48 turas mu dheireadh.